"I'm loving your book! Thank you!!" - Linda H.
As always, welcome to all of the new CDx3 Newsletter subscribers who signed up during May. This is your first issue of the CDx3 Newsletter, a free monthly newsletter devoted to the interests of CDx3 Preferred Stock investors. To be sure that you continue to receive the CDx3 Newsletter each month, please remember to add the following email address to your email address book safe sender list: CDx3NotificationService@us.emaildirect.com. I also wanted to thank all of you who purchased Preferred Stock Investing during May; the book continues to be ranked within the top 100 most popular stock investing books in the U.S., out of close to 5,000 competing titles. Thank you for your interest. The Last Month's CDx3 Investor Results article below explains why June will be a huge month for CDx3 Investors. 59% of CDx3 Preferred Stocks use the calendar quarter to pay dividends to whomever owns them on "pay day." When's pay day? It varies throughout the month, but subscribers to the CDx3 Notification Service receive a calendar each month that shows them the magic days. And whomever owns a CDx3 Preferred Stock on that day, gets the entire quarter's worth of dividend income! June 11, for example, is pay day for a whopping 22 CDx3 Preferred Stocks; own any one of them and you get 90 days worth of dividend cash (about $0.50 per share that you own on that day). This month's Special Announcement article describes the May separation of the Borders.com online bookstore from Amazon.com. Until a couple of weeks ago, as weird as it sounds, Borders' online customers were redirected to Amazon.com. When they split during May, Preferred Stock Investing was included with Border's initial offerings and Amazon.com immediately ran a promotion on the book (which, as of this writing, is still running)! In this month's CDx3 Company Spotlight article I provide you with an update of how the housing market troubles are delivering piles of new customers to apartment provider BRE Properties, Inc. BRE, an issuer of CDx3 Preferred Stock, is wondering what all the fuss is about as new tenant applications for apartments are piling up by the truck load. Ever wonder how a new CDx3 Preferred Stock is created or how you would know about it if it was? This month's CDx3 Question Of The Month article describes the process and how you, as a CDx3 Investor, can watch it unfold - and way before your local broker knows about it, too. The Federal Reserve Board says that they are going to return their focus to inflation management. Does that mean that the credit crisis is winding down? If so, how would that affect the market for CDx3 Preferred Stocks and CDx3 Investors? The Fed meets again on June 24-25 and I will report back to you in next month's issue of the CDx3 Newsletter. The average annual dividend rate being paid by new CDx3 Preferred Stocks* reached 8.54% during May. And Preferred Stock Investing teaches you how to screen, buy and sell the highest quality preferred stocks - CDx3 Preferred Stocks - in order to earn monthly, not just quarterly, dividend income. 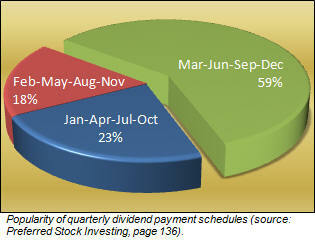 The following chart shows the relative popularity of each of these three quarterly dividend payment schedules. Looking at the above chart, if you were to purchase 100 CDx3 Preferred Stocks randomly, you would receive dividend income from 23 of them each January, April, July and October; another 18 of them would pay you each February, May, August and November; and during March, June, September and December you would receive a cash payment from 59 of them. So, because of the variation in the popularity of quarterly payment schedules, CDx3 Investors end up receiving dividend income every month. How Long Does It Take? 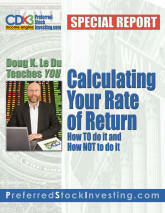 Using this same math, we can calculate how many CDx3 Preferred Stocks you would have to own (assuming random purchases) before your CDx3 Portfolio was producing dividend income for you every month; that is, before you had at least one CDx3 Preferred Stock paying a dividend to you in every month. The answer is six; when you own six CDx3 Preferred Stocks (again, assuming random purchases), your CDx3 Portfolio will provide you with one dividend payment in January, April, July and October; another single dividend payment during the months of February, May, August and November; and four dividend payments during the remaining months of March, June, September and December (the months that end calendar quarters). CDx3 Investors usually add about one CDx3 Preferred Stock to their CDx3 Portfolio each month; doing so would provide you with a CDx3 Portfolio of six CDx3 Preferred Stocks in about six months. At that time, CDx3 Investors tend to start seeing their CDx3 Portfolio generate dividend income every month. June Will Be A Big Month: With June being such a huge dividend income month, subscribers to the CDx3 Notification Service are already anticipating using the cash to add to their CDx3 Portfolios during July at bargain basement prices. Each month, subscribers to the CDx3 Notification Service receive the "CDx3 Bargain Table" (see sample) that provides a list of CDx3 Preferred Stocks that are candidates for purchase at a point in time when their market price tends to be at a low point, significantly boosting yields. For example, the average market price of the CDx3 Preferred Stocks seen on the June CDx3 Bargain Table that subscribers to the CDx3 Notification Service just received is $20.48 per share (well below the $25 par value), producing an average yield of about 9%. Because 59% of the CDx3 Preferred Stocks held by CDx3 Investors are going to produce dividend income this month, many CDx3 Investors will be shopping for new purchases in early July. And the July CDx3 Bargain Table is going to identify over 20 great CDx3 Preferred Stocks when subscribers to the CDx3 Notification Service receive the table later this month. If you would like to start building your CDx3 Portfolio, June is a GREAT month to do so by subscribing to the CDx3 Notification Service. Start building your portfolio of the highest quality* preferred stocks available. And remember - we do the work for you. When Jeff Bezos founded Amazon.com in 1995, he caught the world's top book retailers - Barnes & Noble and Borders - flatfooted. Both of the retailing giants had enjoyed huge customer loyalty, but completely missed what online retailing would mean for the book business. Bezos has since grown Amazon into a $33 billion giant, while others have played catch up or given up entirely. Barnes & Noble launched its bn.com site to help stop the flow of its customer base over to Amazon. It only worked to a limited degree, as Amazon substantially outperforms bn.com on almost every metric. Borders, years ago, realized that it was too late to catch Amazon and entered into a "no other choice" partnering deal with Bezos. If you pointed your web browser to www.borders.com, you would be redirected to Amazon (if you can't beat 'em, join 'em). How this encourages Borders customer loyalty and brand recognition is unclear, but Borders felt it was important to have an online presence, even if it was someone else's presence. A couple of weeks ago, that all changed. Borders split with Amazon and launched their own web site at www.borders.com, complete with free shipping for orders over $25, just like Amazon. And I'm happy to announce that Preferred Stock Investing is included in Borders' initial offerings. You can see Preferred Stock Investing at the new Borders.com web site by clicking here. And not to be outdone, Amazon promptly launched a promotion for Preferred Stock Investing, now (at this writing) offering the book for $2 off of its suggested retail price. Click here to see Preferred Stock Investing at Amazon. 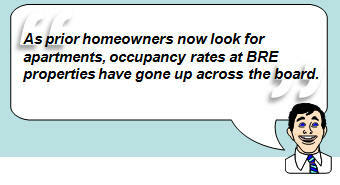 An increase in home vacancy generally means a decrease in apartment vacancy, and vice versa. According to the U.S. Census Bureau, 2.9% of homes are currently vacant. This is the highest home vacancy rate in about 20 years. But just because a home becomes vacant doesn't mean that its prior occupant no longer needs a place to sleep every night. BRE Properties, Inc., a $2.5 billion San Francisco-based apartment real estate investment trust (REIT) founded in 1970, develops or acquires and manages apartment communities throughout California, Arizona, Washington and Colorado. As of March 31, 2008, BRE owned, either directly or via join venture, 23,749,174 rentable square feet over 26,760 individual units. REITs are companies that are not required to pay corporate income tax, as long as they distribute at least 90% of their taxable revenue to the company's shareholders; Uncle Sam then takes his part from the shareholders, rather than from the company. While the current credit crisis has many in the real estate business cutting back, BRE, as a provider of apartments, finds itself wondering what all the fuss is about. In the November 2007 issue of the CDx3 Newsletter, I led a similar story with "Looking for an apartment? If so, you're about to have plenty of company." How's it gone for BRE since then? In their May 31, 2008 Stock Report, Standard & Poor's points out that "the S&P Residential REIT Index rebounded 13.6% during the first four months of 2008, after declining 27.9% for 2007." As prior homeowners caught by the subprime squeeze now look for apartments, occupancy rates at BRE properties have gone up across the board. The same S&P Stock Report goes on to say "The downturn in the domestic housing market has provided some positive benefit for apartment operators. We think renters are staying put longer, holding off on new home purchases and contributing to a generally high level of occupancy." Such an outlook caused BMO Capital Markets to issue an upgrade of BRE last March (to Market Perform from Underperform). While there is still a ways to go before we will see recovery in the U.S. housing market, apartment providers, such as BRE Properties, are enjoying a silver lining of sorts to this "credit crisis." Check out the current list of BRE properties here. How is a new CDx3 Preferred Stock created? What's the process? - Barbara T.
3. transfer trading to the New York Stock Exchange (NYSE) under the permanent trading symbol once approved by the NYSE. To the extent that your local broker becomes aware of a new preferred stock at all, it is generally not until step 3 - transfer to the NYSE. And even at that, your local broker is often only made aware of new preferreds if their corporate office was involved in the introduction process (underwriting) to begin with. The CDx3 Notification Service is the most comprehensive service for preferred stock investors - by far - and is the only notification service that makes subscribers aware of new preferred stocks as they travel through these three steps. 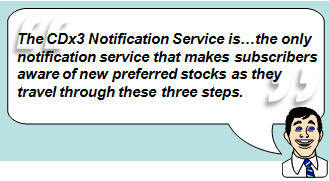 After we filter out preferred stocks that do not meet the ten CDx3 Selection Criteria (Preferred Stock Investing, Chapter 1), subscribers to the CDx3 Notification Service receive "CDx3 Buyer's Notification" email messages as the new issue heads to the open market. "Just Announced:" Depending upon the timeliness of the various regulatory review processes, subscribers can receive a CDx3 Buyer’s Notification message before a new issue starts trading on the OTC stock exchange (i.e. the temporary OTC symbol has not yet been assigned). The Just Announced CDx3 Buyer's Notification email message makes subscribers aware that a new CDx3 Preferred Stock is about to start trading on the OTC stock exchange. "Now Trading": Subscribers also receive a CDx3 Buyer's Notification message once a new CDx3 Preferred Stock begins trading on the OTC stock exchange under its temporary trading symbol. The new CDx3 Preferred Stock will trade on the OTC stock exchange under this temporary symbol until the NYSE approaches its trading application (which usually takes about two weeks). "X Becomes Y:" When the NYSE approves the trading application and assigns a permanent trading symbol to the new CDx3 Preferred Stock, subscribers receive another CDx3 Buyer's Notification email message. Subscribers receive this CDx3 Buyer’s Notification message the same day that the issue starts trading on the NYSE (usually within minutes). Any shares that had been purchased under the temporary OTC trading symbol are automatically transferred over to the new NYSE trading symbol by your broker. We use about six different data sources in order to confirm the information that subscribers see on these CDx3 Buyer’s Notification messages. Having said that, there can still be anomalies. For example, not all brokers are created equal. Sometimes it can take broker systems some time to populate with information for new NYSE issues. I have seen cases where TDAmeritrade will give me a NYSE quote on a new issue, but e*Trade and Schwab will return an “invalid symbol” error for a day or two. The CDx3 Notification Service is the only service available that allows you to see the migration of a new preferred stock from the OTC to the NYSE when it happens. 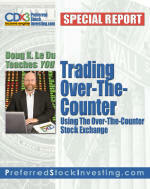 You can learn more about how new preferred stocks are issued onto the Over-The-Counter stock exchange by reading the CDx3 Special Report "Trading Over-The-Counter" (sample | purchase $4.95, free to CDx3 Notification Service subscribers). CDx3 Investors Look Forward To "Seller's Market"
According to the FDIC, the original 2.5 million adjustable subprime mortgages that triggered the current "credit crisis" will finally wash through the financial system by the end of next month. With that part of the problem behind us, the Federal Reserve Board is signaling that they are likely to return their focus to inflation management. The Fed has a two-day meeting scheduled for June 24-25, but is unlikely to announce any major interest rate changes or other "liquidity-oriented" policy adjustments. Unless something major requires it to do so, the Fed, while still paying very close attention, is essentially done force-feeding our financial markets (at least for the time being). Not that there is no more blood to be spilled; we're a ways away from being out of this. Market equilibrium will not return until the availability of credit - for consumers, home buyers, builders, etc. - stabilizes and confidence in the system's ability to meet the demands placed upon it is restored. Plus, there is still more consolidation to be done (bigger, faster swimming banks eating smaller, slower swimming banks). For CDx3 Investors, this credit crisis has pushed the annual dividend rate being paid by newly issued CDx3 Preferred Stocks all the way to 8.875%, with the current average at 8.5%. That's up from about 6.75% just twelve months ago as big banks have had to "sweeten the deal" in order to attract investor cash. Doing so has created a spectacular "buyer's market" for CDx3 Preferred Stocks - relatively high dividend rates at relatively low market prices, sending many yields well over 10%. Once banks stop bidding up the dividend rates for new CDx3 Preferred Stocks, the overall average dividend rate will begin to fall back. What do you think is likely to happen to the market price of the 8+% dividend payers that CDx3 Investors are buying today when the average new CDx3 Preferred Stock issue is paying, say, 7%? Once this credit crisis plays through, dividend rates will fall and market prices of previously issued CDx3 Preferred Stocks that pay higher rates will tend to rise accordingly. CDx3 Investors will return to the "seller's market" where they will enjoy substantial capital gain opportunities by selling the high dividend payers that they are purchasing for bargain basement prices today. As the Fed turns its attention toward inflation management, will June be the month of transition for CDx3 Preferred Stocks, where we see dividend rates level off and market prices start back up? I am anxious to report back to you in next month's issue of the CDx3 Newsletter.